Don’t forget when you’re preparing to head down to the beach, to pack some doggy essentials too, including a water bowl, bottle of fresh water and some food and treats, if you will be on the beach over their usual meal time. Always pack your dog a towel too. As well as helping to protect you from being covered in seawater by your dog’s enthusiastic shake on their return from the sea, it can also be transformed into a cooling aid for your dog, by dipping it in the sea and draping it over them. This is especially handy if your pooch is water-shy and not keen to take a cooling dip. There’s often not a lot of shade on the beach. Therefore, packing a lightweight beach umbrella is vital for any beach trip, as it will provide somewhere for your dog to shelter under if they need to get out of the heat. It’s also a great place to keep their food and water, to ensure it stays nice and cool. Plus, if the British weather lets you down and surprises you with a shower, you’re all set to sit it out. 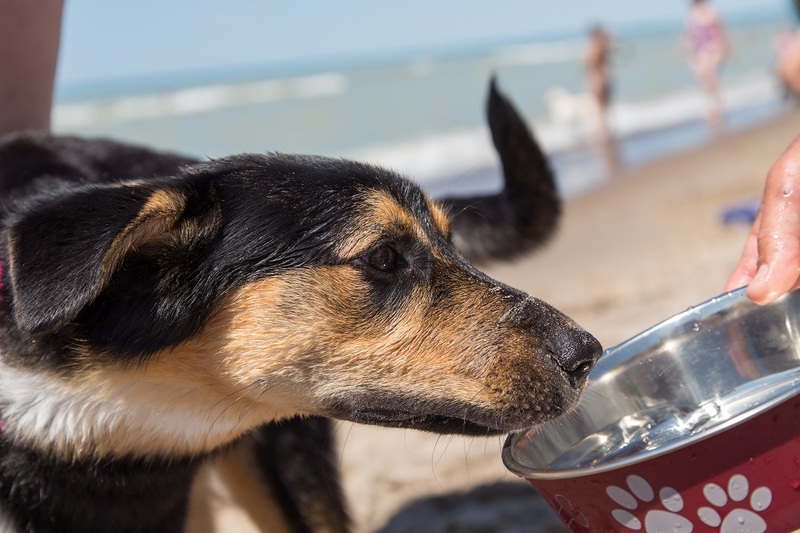 The heat combined with the sand and seawater can leave your pooch feeling extra thirsty. So, make sure you pack plenty of fresh water and a portable bowl for your dog, to help keep them well hydrated. Try to discourage your dog them from drinking seawater where possible, as this can upset their tummies and dehydrate them. Instead, keep a bowl of cool water available for them at all times. If your dog loves nothing more than dashing into the sea to show off their excellent doggy paddle, make sure you keep a close eye on them. Strong currents and tides can result in even the strongest doggy paddler finding themselves in trouble. Light-haired and thin-coated dogs that have areas of pink skin exposed are especially at risk of sunburn, which can increase their risk of getting skin cancer. So, make sure when you pack your sun cream to pop a dog-friendly one in your beach-bag too. Their ears, nose, belly and groin are especially vulnerable and will need protecting. It’s best to avoid hitting the beach at the hottest times of the day e.g. midday. Instead, schedule your beach excursion for first thing in the morning or later in the afternoon. Check the temperature of the sand before taking your dog on to the beach, as sand can heat up as the day progresses and could burn your dog’s paws. Follow these simple tips and you and your pooch will have a ‘pawesome’ time at the beach! ©2018 Merial Animal Health Ltd. All rights reserved. Merial is now part of the Boehringer Ingelheim Group of Companies. Date of preparation: Jun 2018. PE2590.